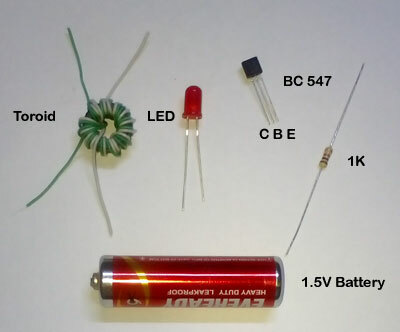 We cannot light an LED using 1.5 V battery, since the forward voltage of all LEDs is above 1.8V. 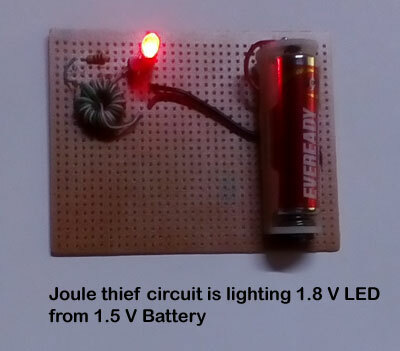 So by using the Joule Thief circuit, we can boost the 1.5V of a battery to 3V or more. 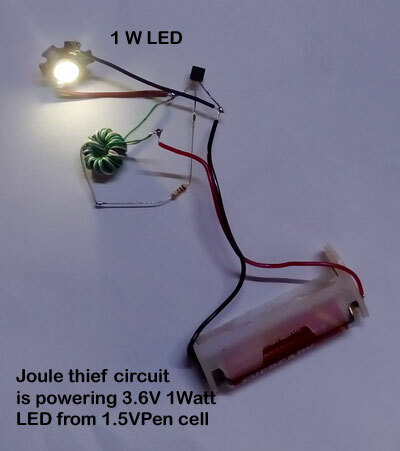 The Joule Thief circuit is very efficient so that it will light the LED even if the battery voltage is as low as 0.8 V.
Joule thief circuit works by rapidly switching a transistor connected to a Toroid transformer having both primary and secondary windings. 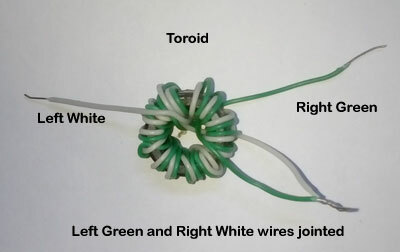 The Toroid can be easily made by winding plastic wires in a Ring core. 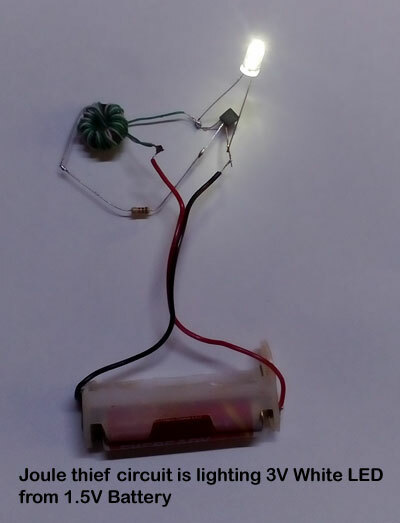 When the circuit is connected to the 1.5V battery, the transistor rapidly switches on/off. Initially, current flows through the secondary winding, resistor and the base-emitter of transistor. This triggers the transistor and its collector current starts to flow through the Primary winding. Since both the two windings are connected in the opposite directions, this induces a voltage in the secondary winding which is positive due to the polarity of winding. This turns on the transistor with higher bias. This Self stroking or Positive feedback instantly turns on the transistor and the Collector – Emitter path works like a closed switch. Since the Primary winding is across the battery, the current flow increases at a rate proportional to the supply voltage divided by the inductance. In short, once the current in the coil stops increasing, transistor turns off and opens the Collector-Emitter switch. At the same time, the Magnetic field collapses inducing much voltage to drive the load. When the field returns to zero, the whole sequence repeats. 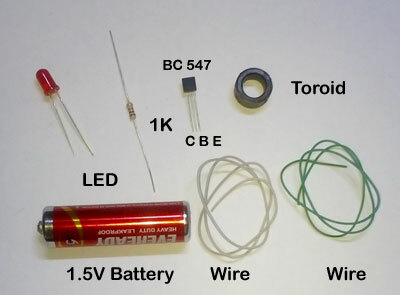 Toroid winding is an important job for making the joule thief circuit. 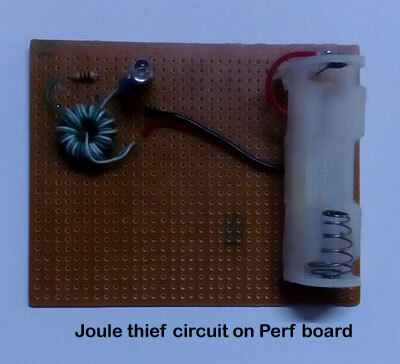 Procure a Core from an old SMPS or electronic chock. You can also purchase from electronic shops. Take 30 cm length two coloured thin wires preferably Toroid winding wire. Wind closely through the Ring core to make 10-15 windings. If the size of the Core is large, and windings are numerous, efficiency of the Toroid increases. 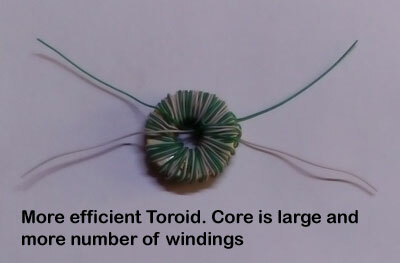 After completing the winding, the Toroid will have four wire ends. One wire is primary and the other is secondary. Now make connections. Join the opposing wires (opposite ends of the two wires. ) together to connect with the battery positive.See image. So now there will be three leads. Connect one lead to the collector of transistor and the other to IK resistor that going to the base of transistor. Finally, connect the jointed wires to the +ve of battery holder. The negative of the battery holder should go to the emitter of transistor. 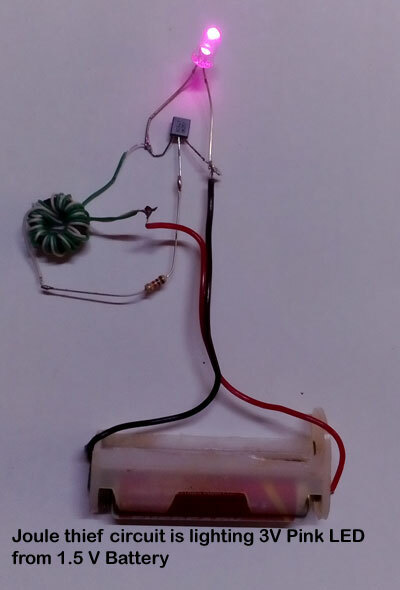 Now connect the Anode of LED to the collector and Cathode to the emitter of transistor. 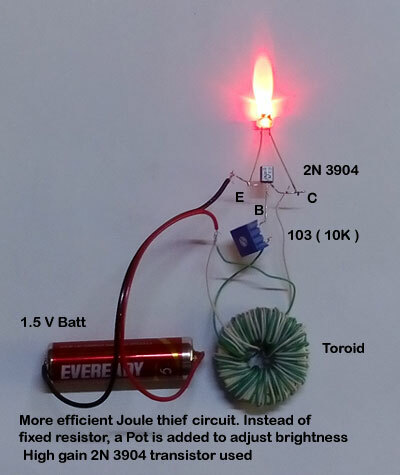 Joule thief is ready. 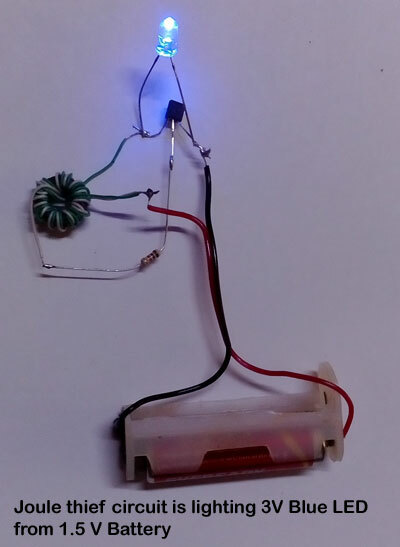 Connect the 1.5V Battery in the holder. LED will light instantly. Actually, the LED is blinking very fast based on the oscillation of the circuit. But we will not feel this blinking because the oscillation is very fast. 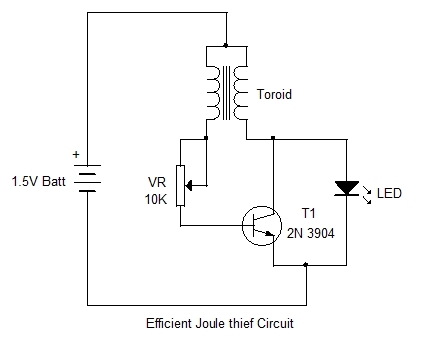 We can increase the efficiency of the Joule Thief Circuit. Use a large Toroid core and more windings. 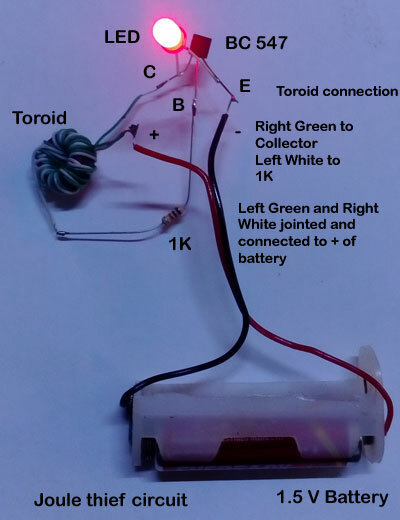 Instead of 1K Fixed resistor, use a 10K Pot so that you can adjust maximum brightness of LED. very nice circuit. Thanks. Your mail id is not working. I have tried more times to send a mail reg. 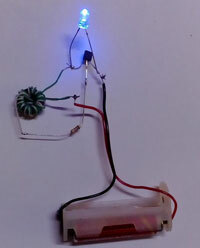 melody generator project. Kindly send your correct mail ID. Yourmail id was :dmohankumar.wordpress.com in the forum.